Ethnix Sax & Strings provides Atmosphere, class and style – performing light jazzy, African and contemporary classics, this ensemble provides background music and entertainment for up-market events, dinners, cocktail functions and events where soft, sophisticated ambience is required. The ensemble strives to perform music that suits a diverse cross-cultural audience and accommodates different styles of music. 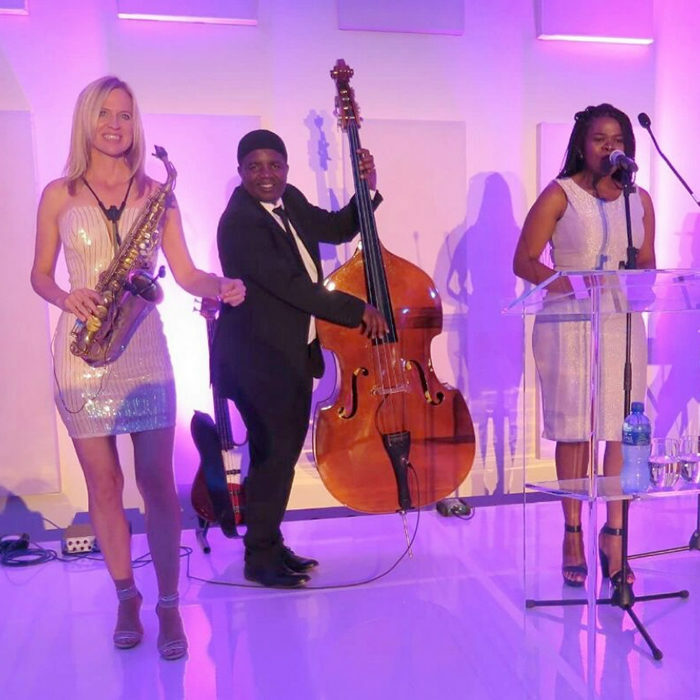 The music ranges from soft, jazzy music such as “Summer time”, “Misty” and “What a wonderful World” to African favorites “Meadowlands”, “Pata Pata” and “A cry, A smile, A Dance”. Some Kenny G numbers skillfully performed on the saxophone and classical music such as Pachelbel's “Canon” and “Air on a G-string” on the violin. Together with the Double Bass, the ensemble has a full acoustic sound which completes any event. They can perform quiet acoustic numbers as well as pick up the tempo later during the evening to more energetic Latin – American, Cuban and swing styles. Up-tempo African classics such as Emlanjeni (Mafikizolo) and Ndihamba Nawe lifts the mood and get the fingers clicking.